What’s The Best Age to Start Having Botox? Is Botox vegan friendly and cruelty-free? While there are many skincare products which I don’t care for (that’s another article *adds to to-do list*), there are only a handful of skincare products which I LOVE. One of these is, you guessed it – the topical antioxidant! As we’re all aware, there are many products on the market making big promises. They all seem to possess pretty packaging, celebrity endorsements, and inflated price tags, but do they actually do what they say on the tin..? Rarely. On the other hand, I’d be delighted if all my loved-ones and clients used a vitamin C topical antioxidant every day because I KNOW they work. What’s more, I’m confident about the positive impact they’ll have on the future of your lovely skin. 1 – They’re anti-inflammatory. This is vital for controlling inflammation in your skin. Such inflammation can, and will, develop if left unchecked (think redness, broken capillaries, rosacea). A good antioxidant will also build your skin’s resilience, allowing it to better cope with the stress and damage it undergoes on a daily basis. 2 – They’re anti-ageing. They correct signs of ageing, including fine lines, as well as firming the superficial layers of the skin. 3 – It repairs sun damage, by eating up those horrid free radicals, along with providing your skin with more sun protection (it works a treat with an SPF, like a power-couple). 4 – It gives you your GLOW back, and we all want that, right? Vitamin C is gorgeously brightening and causes your skin to radiate with vitality. 5 – It breaks down pigmentation and prevents more from developing. This is why most people start using a topical antioxidant – to get rid of those pesky brown spots! But it is best ( and easiest long-term) to use it to PREVENT rather than correct. 6 – As you’ve made it this far, here’s a bonus tip! Some, decent and researched based, antioxidants such as C E Ferulic have anti-carcinogenic properties and may help prevent skin cancer. A very bold statement I know, but incredible none the less. How to choose the best antioxidant for your skin I KNOW there are plenty of vitamin C serums out there but, quite frankly, most of them won’t have much effect on your skin. Why? Because the active ingredient isn’t usually of high enough a percentage to make a difference. Also, they’re often unable to penetrate into the dermis, due to their stability and pH. So, there you have it: my top 5 ( or rather, 6, oops!) 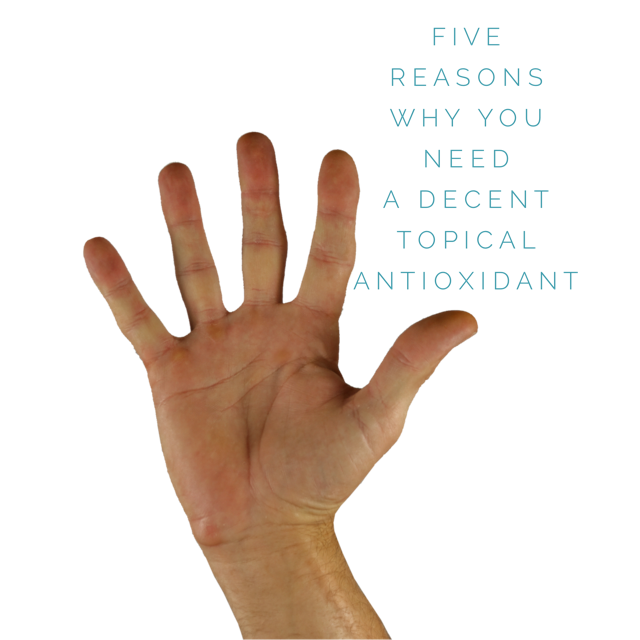 reasons why you need a topical antioxidant in your daily skincare routine. I think of mine as a ‘treatment in a bottle’. While the ones I recommend are not cheap, you know what they say – Buy cheap, buy twice! Plus, when you’re considering your skin’s health, and what a high-quality topical treatment does for your appearance, they’re totally worth it. This is the one I use and love and I literally never leave home without applying it. No way, Jose! I have in the past, and regretted it. You can have a look at the range I recommend here, which in my opinion (and I’ve tried and tested many vitamin C antioxidant serums) are the best on the market, patented and all that jazz as they’re so good. They have all the clinical studies and research to back their bold claims. Better still, I’ve seen them work absolute wonders on my client’s skin, as well as my own. If you need help choosing the right topical antioxidant for your skin, you can either book a consultation with me here. Alternatively, drop me a line and I’ll be happy to help. Why Choose The Skin Nurse?